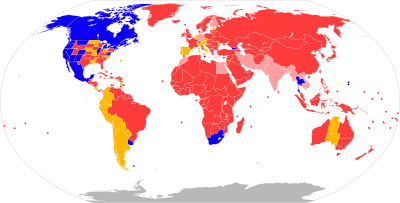 The use of cannabis for recreational purposes is prohibited in most countries; however, many have adopted a policy of decriminalization to make simple possession a non-criminal offense (often similar to a minor traffic violation). Others have much more severe penalties such as some Asian and Middle Eastern countries where possession of even small amounts is punished by imprisonment for several years. As of April 2019, public possession of small amounts is a non-criminal offense punished by escalating fines. A third offense can result in criminal charges, however. Possession in the privacy of one’s home is not punished. United States Legal in 10 states, 2 U.S. territories, and the District of Columbia – but illegal at federal level. Decriminalized in another 14 states and 1 U.S. territory. ^ “Partial decriminalization of public cannabis use takes effect Sunday night”. The Times of Israel. 31 March 2019. Retrieved 5 April 2019. ^ Viray, Patricia Lourdes (18 December 2018). “Fact check: Is medical marijuana already allowed in the Philippines?”. The Philippine Star. Retrieved 28 December 2018.